In the Mother City you can experience a thought-provoking exhibition titled “Design & Making [the story of food]. This collaboration traces the evolution of craft and design through food – in particular, the vessels used for its preservation, storage, packaging and distribution. This collaboration sees PETCO and its members, working together with the Cape Craft & Design Institute (CCDI), Iziko Museums of South Africa’s Social History Collections Department and talented designer Aidan Bennetts and his team. It is an official Cape Town World Design Capital 2014 project (#461) and is on display at the Castle of Good Hope from 12 May – 12 October this year. “In focusing on food, we are focusing on the essence of life, the grand sweep of history, monumental shifts in the landscape of production, industry, and commerce, and the impact of all this on society, communities, and ordinary people,” said Marjorie Naidoo Manager Communications and Sector Promotion of the Cape Craft & Design Institute. Packaging materials provide a means to preserve, protect, merchandise, market and distribute products. They play a significant role in how products reach the consumer. The exhibition tells the story of food preservation, storage and packaging over time and reveals how vessels have been radically influenced through human development and technological innovation. It also presents the opportunity to show how craft and design represent a continuum of making processes that result in tangible products and delves into contemporary challenges created by convenience food, consumerism, waste and the issue of food insecurity in the context of global excess – all of which require innovation solutions- through design. “The relationship between the food, packaging design and functional necessity over the ages has been showcased in a provocative way” says Cheri Scholtz, CEO of PETCO. “We are delighted that PETCO could play a part adding to the narrative, and in particular through the plastics installation, tell our own story of the relatively young entrant to the packaging market, polyethylene terephthalate (PET), and how its physical properties allow for great freedom, innovative design, recyclability and closed loop production”. “Working on this collaboration with PETCO was an education for us at Aidan Bennetts Design, through the process of designing and building the installation we discovered that plastic has a lot to offer and there is so much more than meets the eye” concluded Aidan Bennetts. 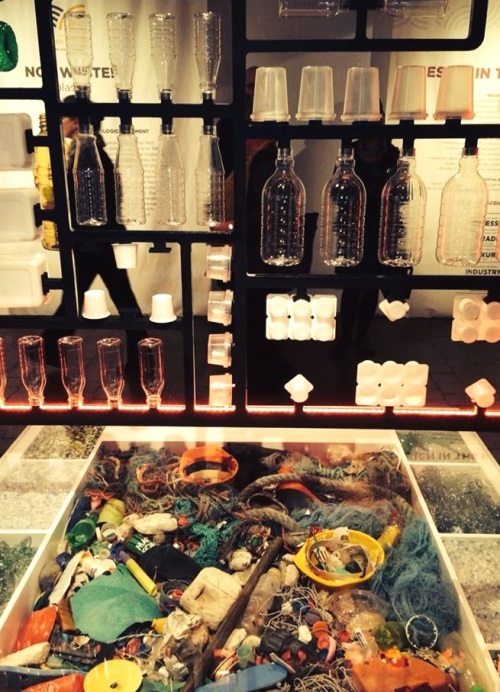 PETCO, the industry body for recycling of PET, sees the value of making the connection through design and the importance of museums as a place of inspiration, identity and learning. All are encouraged to go and visit this Cape Town World Design Capital 2014 project proving that local designers have the ability to make a real difference. For more photos of the event check out this gallery. For the PETCO Recyclability by Design Guidelines click here.